I hope you can help me. My Valentini Puffer showed up with this lump on the left side of her neck 2 days ago. She is in a 30 gallon tank with 1 Lawn Mower Blenny. Initially, I thought it might be air or she picked at a snail, but it has not gone away, nor has it increased in size. It is the lump right under her chin. I tried the burping method (lightly grasping her body with nose up) and was getting ready lightly run my fingers down her torso, but she puffed up and I have never seen her do this, so I released her quickly and then was not able to grab her again without stressing her out. 30-50% weekly water changes with Kent Reef Crystals and Prime. Tank has been set up 8 months. Some SPS coral frags, frogspawn and a couple of mushroom frags. Live rock & sand. Lots of Nassarius snails. She still eats great ( homemade mixture of frozen squid, clams, muscles, shrimp, scallops, silver slides, peas, Nori and vita Chem all blended up and frozen). 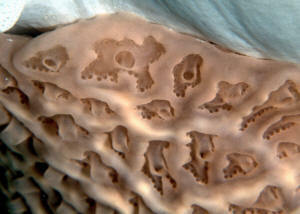 Once a week, I give her a clam or muscle on the half shell to aid her teeth. Poop is normal and she is acting like she always has. today and try to get rid of it. Thank you again. You guys have been very helpful to me in the past, so I'd like to run another question by you. I have a c. papua currently in quarantine, scheduled to be added to my 90g FOWLR in about two weeks. So far, he has basically ignored the NLS pellets that I've been giving him in the morning, but pigs out on anything frozen (1/6th of a Mysis cube, mixed stuff, etc., usually soaked in Selcon). He's only about 2" long, and to me appears to be in very good shape, but I worry that I'm not feeding him enough, since he really only eats once a day. Should I be giving him something a little meatier in the morning? I just started adding Nori to his diet, which I was surprised to see him like (enough to play tug-of-war with me over it!). I do plan on giving him some kind of shelled seafood or snail once or twice a week to help with the teeth. Overall, how does this diet sound? Any changes you'd recommend? while I have done some research on them he was a bit of impulse. I asked the LFS to feed him so I could make sure he was eating. Well the guy came back with live feeder fish, I cringed because I know better than to feed them those! Well he said he has been eating frozen to but I figured he could be trained so I bought him. He has been eating flake and frozen Mysis, but is not much on the frozen sea food mix I bought from the grocery store. I believe it because the Mysis and flake move about like live food. I was wondering if live glass shrimp or fresh water snail would be good to keep his "teeth" or "beak" down. While all the research I have done it mostly show information on larger puffer fish. I was not expecting his mouth to be so small. If glass shrimp or freshwater snail will not work to wear down what are some suggestions you guys might have. Yes he is a Toby I know that the larger ones you can feed clams and cockles. What would be the best thing to keep a Toby puffers "teeth" down? Thank you in advance-- your pages have answered many questions for me in the past, and I am a huge fan of your work. I have a 55 gallon fish-only tank with live rock, three damsels, two Ocellaris clowns, a flame Hawkfish, five little hermit crabs and five Nassarius snails, and for a month now, a 2.5-inch Hawaiian white-spotted Toby (C. jactator). I do a 50% water change once a month. Until recently I had a C. solandri who thrived for five years on flake (Formula One and Prime Reef) plus once or twice weekly frozen cube Marine Cuisine (brine, krill, Mysis). My new Toby won't touch the flake or the Marine Cuisine, but he also won't touch (or he will mouth and then spit out) defrosted Carnivore Creole (squid, octopus, clam, scallop, fish + vitamins and garlic), and he ignores clams on the half shell. He also hasn't touched the snails or the hermit crabs (he pecks them, particularly if I hold them up, but hasn't seriously tried to eat them). I feed him 1/2 of a frozen krill two times a day. I know from your site, however, that this isn't enough to meet his nutritional needs. I'm not sure what to do.. I haven't been able to find anything about puffers and tobies not liking clams.. I have tried fasting him for a day or two, but I haven't had the heart to try more. 1) I've tried fasting and foods with garlic.. Do you have any other recommendations for him to eat a more varied diet, specifically to get him to eat clams? 2) How long is it okay to leave a clam in the tank before pulling it out? I don't leave them in for more than 6 hours. 3) Is there any ballpark figure on how long it is 'safe' to fast a Toby, for their health and the heath of their tank-mates fins? 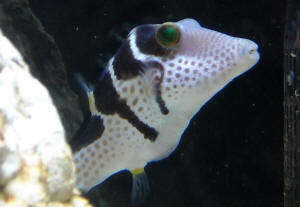 4) I'm also wondering, is a whole krill a day for a small puffer over-feeding? Or under-feeding? Thank you so much for your time, and any advice you have is greatly appreciated! I have a spotted Toby, and I am not sure of the exact species name. 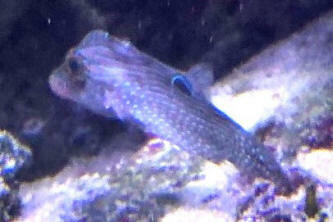 It is either a (Canthigaster spp.) 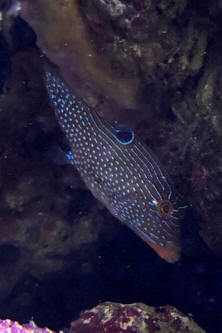 or (Canthigaster amboinensis). He looks like your website photo of "Ambon Sharpnose Canthigaster amboinensis" which has iridescent blue spots on his body and blue stripes around his eyes. I have had him or over 4 years and he is the only fish that has lived through many fish kills when I had problems establishing my tank. I call him Job. 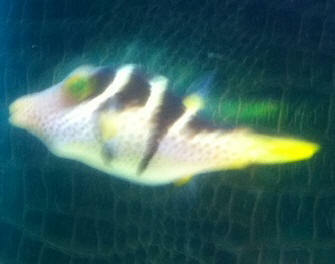 He has never nipped at other fish and has an amiable personality. He is not aggressive at all. He eats the ghost shrimp I place in the tank for his feeding, yet he also eats flake food and dried seaweed. My 50 gallon tank is now well established with live rock and live sand. I have 2 filtration systems (hanging and under cabinet canister) I change my filters (charcoal filters, Algone, Chemi Pure) when necessary according to directions. I also have a protein skimmer, UV filter, temperature control system, and 4 water flow jets. I have 1 Pencil Sea Urchin, 8 Mexican turbo snails, 2 sand sifting starfish, 1 Cleaner Shrimp, 8 small blue legged hermit crabs, and 2 small emerald crabs, all of which help clean the tank from algae and debris. I also have 1 Yellow Belly Pacific Blue (Regal) Tang, 1 Percula Clown, 1 Royal Gramma, 1 Neon Goby, 1 Zebra Goby, 2 Blue Chromis, 1 Six Lined Wrasse, 1 sand sifting goby (Watchman), 1 Lawnmower Blenny, 1 Midas Blenny, 2 Firefish Gobies (1 red, 1 purple). All of the fish are less than 3" in length, except the tang which is about 6"; There are also small corals in the tank (1 Yellow Leather, 1 Red Brain, 1 Moon Brain, 1 Trumpet, 1 Blue Mushroom, and 3 Ricordeas. 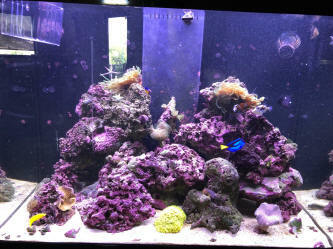 I have coralline algae on the live rock. All of the fish seem healthy, however the Toby has not been eating well in the past few weeks. I keep ghost shrimp in the tank for him to eat, yet have had to hand feed him frozen shrimp in the past few days in order to get him to eat. He has always been tame and does not puff up when hand fed in the tank. I do not use nets on him. For years, he has come up to my hand when I place food in the tank. However, lately, his coloring has faded (more gray and less vibrant) and he rests vertically against the glass in the tank constantly. He has gotten smaller in size and his skin on his sides seems to hang down which look like fold lines. His tail is become frayed. (See photo). None of the fish bother him. The only fish I have a problem with is the tang because he is so much larger than the other fish. When the fish are fed, the tang hordes the food and eats as much as he can, taking away the food from the other fish. I have had to segregate the tang when feeding the other fish. I found a bristle worm in the tank a few weeks ago and removed it. I checked the tank substrate and rocks for more worms and have not found any more. There were clear tunicates in the protein skimmer and some green hair algae on the back glass which I have had to clean recently. I don't know if bristle worms, tunicates, or hair algae are the cause for the Toby's demise. I read one of your posts regarding "Puffer Care and Information" and it stated that puffers can be susceptible to parasites. I do not know if this is his problem and if so how do I get rid of the parasites on him? Can I place him in a quarantine tank with a copper or other treatment? Please respond. I do not want to lose my favorite fish. Thank You. I got my Valentini Puffer a week ago, and have been feeding him twice a day little pieces of shrimp. Two days ago, he stopped eating. I came to your website and found that shrimp is a bad food source, so bought some squid and seaweed. He refuses to eat those, as well. I tested my water conditions and had 0ppm for ammonia and nitrites and <10ppm for nitrates. The salinity is at 1.02. The ph is a little low at 7.8.
garlic, but he still wouldn't go for it. His teeth don't seem too long, either. I've done everything I know to do, and I'm am looking for more ideas. He is looking very skinny now, so please respond quickly! So while prawns and mussels are good sources of protein, balance them out with seafood that doesn't contain thiaminase, such as cockles and squid. As he swims around the tank his posterior end bumps into things. Also he seems to be sitting on rocks. Granted, I have seen him sleep before, but he never rests on rocks in the middle of the day. Maybe it could even be considered rubbing. He has what looks like gray spots on the right and left side of his beak. From my reading, that seems to be stress lines. Stanley was just transferred into the tank two weeks ago. No problems, mushrooms and other fish doing fine. I have a goby and a bulldozer shrimp in the tank with him (they get along okay, and the other fish appear to be fine, although i don't see them very often.) The tank dined on bloodworms last night. <Bloodworms aren't really the ideal thing for Canthigaster puffers, though they like them, and really do need a richer, more marine-based diet. I'd be looking more towards krill, mysids, chopped cockle, minced squid, and other such frozen marine foods. Conversely, brine shrimp, though widely offered, contain virtually no useful nutrition, being almost entirely "fibre". Stanley is pretty awesome, hate to have anything happen to him. What do you think is up, and can i do anything to help him? Thank you! I knew at one time that he was larger in the belly, but was told that I was overfeeding him. I will go buy him some seafood today. Won't be too hard as I am in south Louisiana. I don't have a quarantine tank, would it be okay to leave him with the goby and bulldozer shrimp? or does he present a clear and present danger to them? 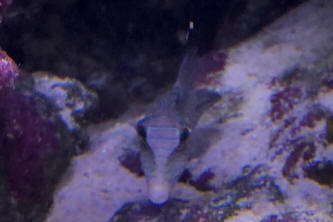 <He'll likely ignore the goby, assuming the goby spends most of its time hidden. As for the shrimp, it's always a gamble with puffers; shrimps are dinner, but the larger species may be robust enough not to be viewed as edible. If he hasn't bothered the shrimp thus far, you're probably fine. Thanks again for the advice. I doubt I would have any fish without the help of your website. I fed it Newlife Spectrum 1mm sinking pellets and it would eat the most out of all the fishes in my tank. It looked very hungry. bloated. Hope this makes sense. and then as it swims out it looks totally normal(it's behavior) but then goes back to finding a place where it can settle and not be disturbed. Right now it's resting his large swollen belly on a rock and just chilling in the same spot. What should I do? I read the many questions you answered on the FAQs but didn't want to stress out my puffer(using the methods to expel air out of his body) if that wasn't the case. Did he just eat too much? Thanks for all your help in the past, your advice is invaluable. I have scoured through the site and also have bought Bob Fenner's book but I haven't been able to find the answer to my question. Lipovit. We have tried feeding him new era marine pellets which he largely ignores and now recently some formula 1 flakes which he totally ignores. Is his current diet of 'live' foods balanced enough for his needs? Also the other thing is that we would like to start him on the formula 1 flakes because it would be easier to feed it to him when we go on holiday as opposed to live foods which would require someone to come in every other day and feed it to him, which is a bit difficult (we have 1 of those holiday feeders which runs on a timer). hungry that he will have no choice but to try to the flakes. I feel slightly bad doing this though as he seems so hungry. Also there is the concern that if we persist with the flakes he will start munching on the cleaner and fire shrimp and double his attack on the coralline.